So last time I was at Pole I started a wild sourdough culture with which to make breads, pancakes, waffles etc. I ended up preserving him and bringing him back to Iowa where he was adopted and named Kurt Russel after The Thing actor that, like my culture, just wouldn’t die. So now that I’m back I figured I’d start another culture, and I’m gonna show you how I’m going to bring Jack Nicholson (The Shining is another South Pole favorite) to life. First I found a 1 quart tupperware with a loose fitting lid in which to incubate the fledgling Jack. Then I combined 4 ounces (by weight) lukewarm water and 4 ounces (by weight again, like all good baking is done) all purpose flour in said tupperware until it resembled a sticky batter. Finally, and most importantly, I found a source of wild yeast. Back in the real world (and probably here, but I’m super impatient) you could just leave your sticky concoction out for a few days until it hosted a wild yeast colony or rotted and you had to through it out. But a surefire way to introduce wild yeast to your starter is by finding a fruit or vegetable with a lovely bloom on it. A bloom is that whitish layer on the outside of the pictured cabbage, but can also be found on grapes, onions or pretty much any produce. 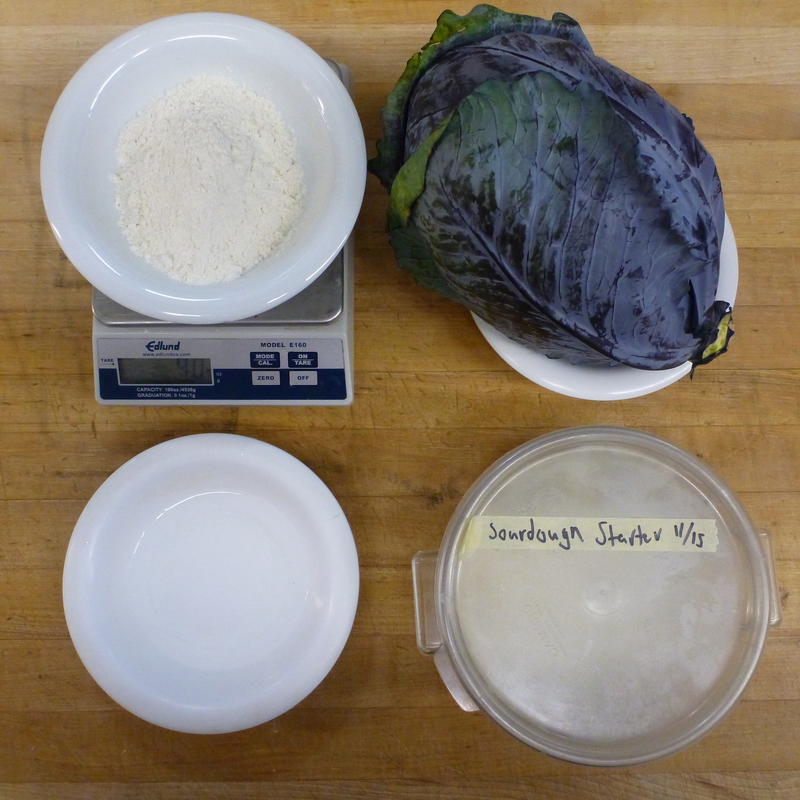 So what I did was after my flour and water were well mixed I just threw a piece of this cabbage in that was covered in the yeasty bloom. And now we wait. In 24 hour I’ll feed Jack another 4 ounces each of water and flour and will repeat that process until he is a healthy, happy, bouncing sourdough culture. Then I’ll mix him into my favorite bread/pancake recipe and make magic happen. Stay tuned to Jack’s progress, and when he is fully grown I’ll share my favorite sourdough recipes with y’all! This entry was posted in antarctica, baking, Chef, cooking, recipes and tagged bread, chef, diy, food, recipe, sourdough. Bookmark the permalink.